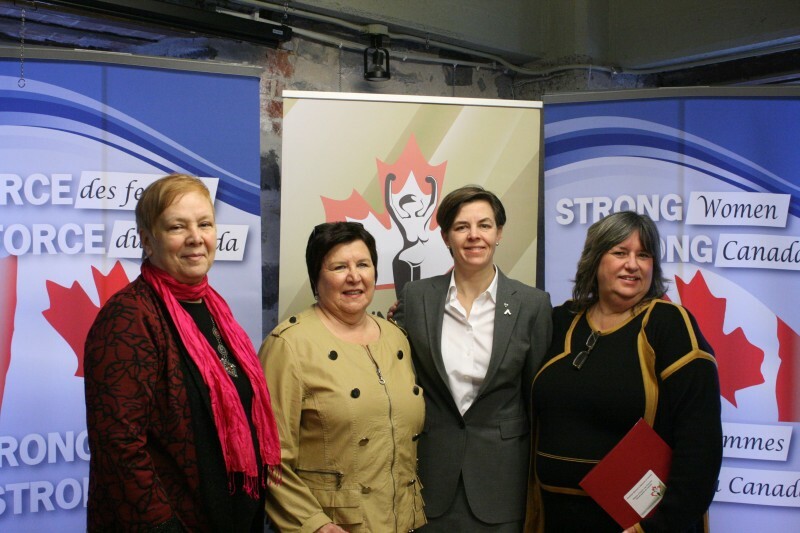 December 9, 2013 (Montreal) – “The DisAbled Women’s Network of Canada-Réseau d’Action des Femmes Handicapées Canada (DAWN-RAFH Canada) wants to acknowledge your leadership and to thank you and the Government of Canada and all of our project partners today,” said Bonnie Brayton, National Executive Director. The Honorable Dr. K. Kellie Leitch, Minister for Status of Women and Minister of Labour is at the Maison Parent-Roback to announce funding through Status of Women Canada’s Community Fund to support work to reduce the rates of violence against women with disabilities. The project is entitled Responding to Violence in the Lives of Women with Disabilities and Deaf People: A Local Level Community Development Approach and is being carried out in thirteen provinces and territories across Canada. Brayton went on to say “We are working with our national partner, the Canadian Association for Community Living (CACL) and as you will hear today the early findings are already very exciting – using a community development model that’s grounded in (leadership) engagement, education and systemic change. Imagine – Social Planning Councils, YWCA’s, Chambers` of Commerce and Municipal Councils. Western University`s Centre for Research & Education on Violence Against Women & Children’s Learning Network Partner with DAWN-RAFH Canada to develop new resource! We are also very pleased today to be launching a new multi-lingual, accessible resource aimed at understanding and addressing violence against women with disabilities and Deaf women. Produced in collaboration with the University of Western Ontario’s Centre for Research and Education on Violence Against Women and Children, the Resource, which is comprised of a print and electronic newsletter and two learning Briefs, highlights the intersectional context of violence experienced by women with disabilities, draws on their lived experience, and provides statistics and resources. “We are pleased to have partnered with DAWN-RAFH Canada to produce this newsletter, because violence against women with disabilities and Deaf women is such an under-recognized, under-researched and under-resourced social concern”, said Linda Baker, Learning Director at the Learning Network Team at the Centre. Based on both research and lived experience of women with disabilities, the publication sheds light on the range of ways in which women with disabilities experience violence – leading with a very thought-provoking Brief on Ableism as an overarching and unnamed form of violence against women, in addition to physical, sexual, psychological, and financial abuse at the individual level, as well as at the systemic level. To ensure that the publication is inclusive, Western University and DAWN-RAFH Canada are launching this today in English, French, American Sign Language (ASL) and Langue des signes quebecois (LSQ) and other accessible formats. It’s a clear signal to us that with the right approach and leaders that are committed to an inclusive and safe community for all women, we can be hopeful!